Accessories: Accompanied by Omega Extract of the Archives confirming the production of the present watch on September 15, 1915. Omega was amongst the first brands to create wrist chronographs in 1913 and the present timepiece from 1915 with a military background can certainly be considered an important piece of the company’s early history. The 18”’ SOPB CHRO was originally a pocket watch movement housed here in a substantial 46mm silver case. 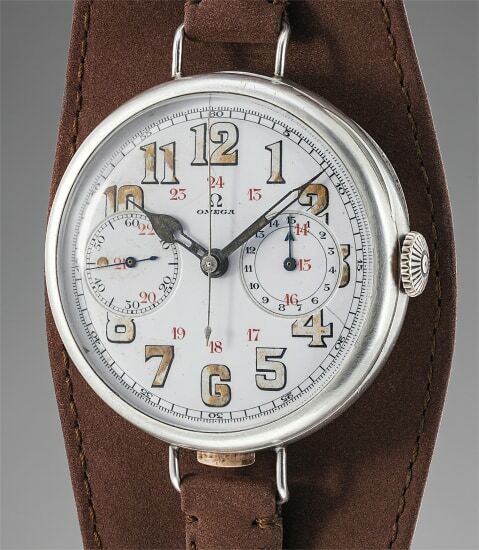 The enamel dial bearing large luminous military style Arabic numerals is striking in its modernity. A pink gold plated button placed discretely between the lower lugs starts, stops and resets the chronograph. The caseback is engraved with the initials C.G.L. Wolf a trained biochemist who reached the ranks of Captain in the British Royal Army Medical Corps where he served in the Hygiene Laboratories in Boulogne, France during World War I. So important is this watch within Omega’s history that in 2018 it relaunched this chronograph in an exclusive 18 piece limited edition using original movements from 1913. The watch has remained in incredible condition considering it was made over a century ago. The historical importance, the military background, the striking features and its ultimate rarity make the present timepiece a must have for the avid collector.